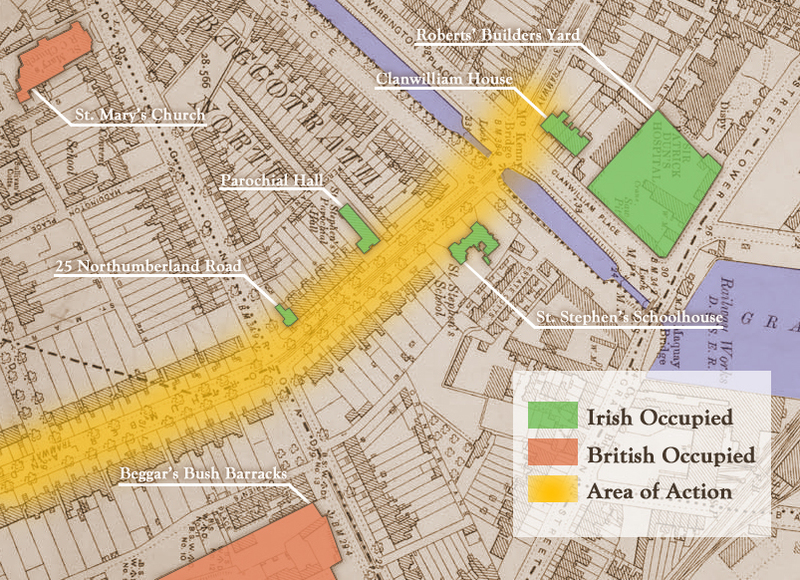 The Battle of Mount Street Bridge was, militarily, the most successful rebel engagement in Dublin. Though eventually defeated, the rebels held up two nearly full-strength British battalions (some 1750 soldiers) for several hours on Wednesday 26 April, and the significant British casualties inflicted by a small band of Volunteers served as a powerful piece of propaganda, emphasising the bravery and sacrifice of the rebellion. There is general agreement that the battle began around noon on Wednesday as the 2/7 Battalion of Sherwood Foresters approached the intersection of Northumberland Road and Haddington Road. 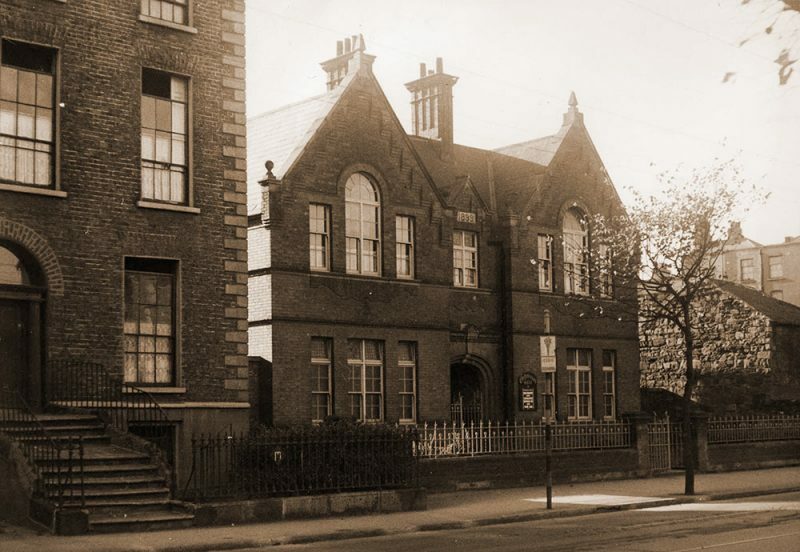 Until well into early evening, the 2/7 and 2/8 Battalions were held off by Volunteers placed strategically by Michael Malone in three buildings on Northumberland Road and on the canal (Clanwilliam House). The Battle of Mount Street Bridge took place in a relatively concentrated area, as indicated in the map above. Malone’s stand, Grace’s dramatic escape from No. 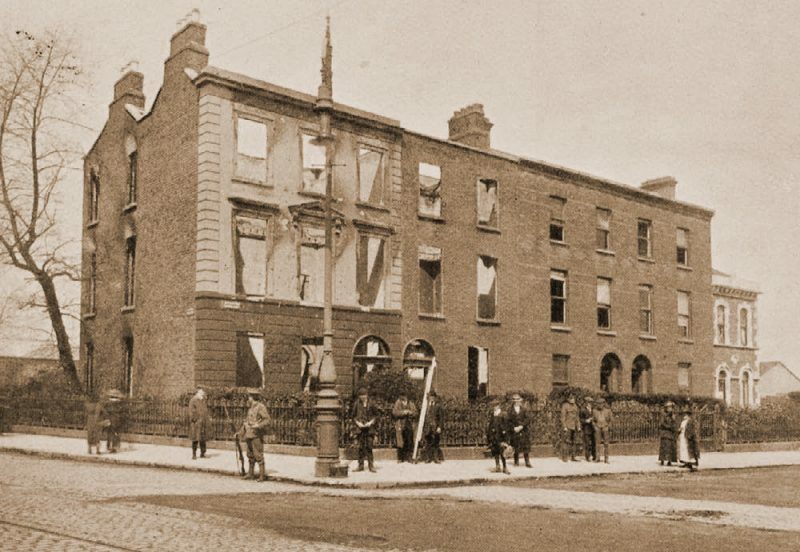 25 Northumberland Road, and the fall of the burning Clanwilliam House fit easily into the republican narrative of Easter week. The four Volunteers killed during the battle, and Malone in particular, became prominent names among the republican dead. 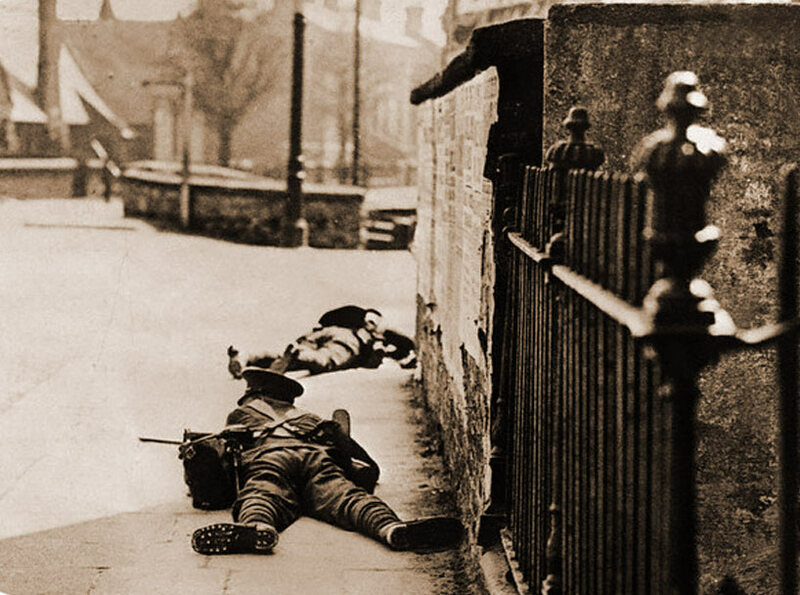 Though only lasting a number of hours, the battle accounted for a significant proportion of the British military casualties during the Rising and was a minor military disaster for the British. 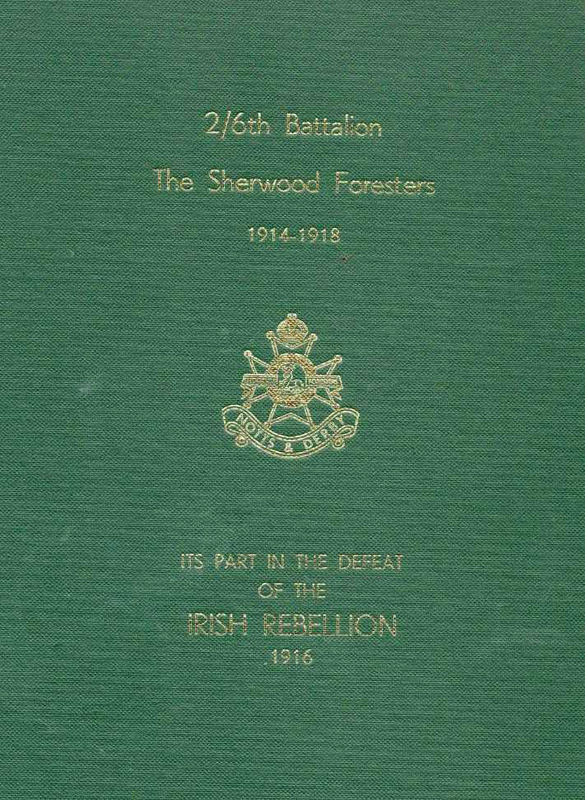 The battle was also somewhat unique among the fighting in Dublin and far closer in nature to a guerrilla-style ambush (though the Sherwood Foresters later insisted they had not been ambushed). No. 25 Northumberland Road where Michael Malone was killed during the battle. For Malone and Grace in No. 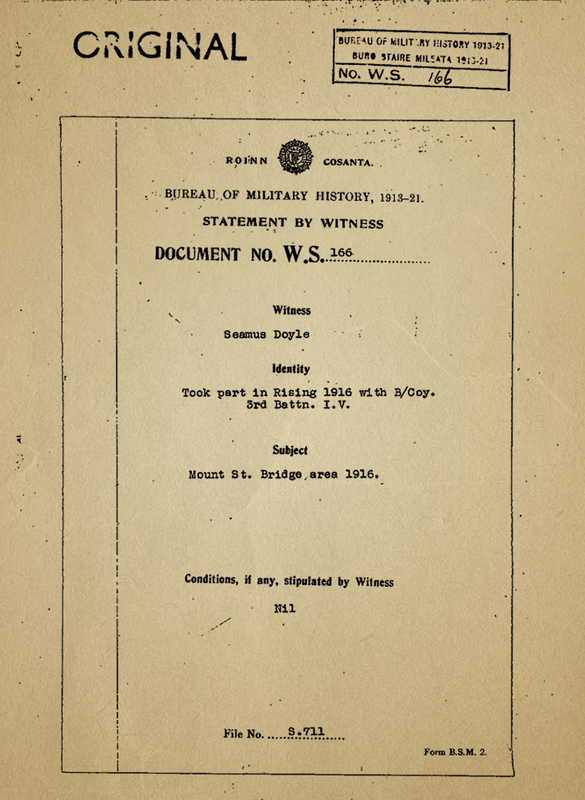 25 and the four defenders of Clanwilliam House in particular, the fighting they experienced was far more intense than that experienced by many of their colleagues; Boland’s Bakery, for instance, where the remainder of the 3rd battalion was based, was not similarly besieged and saw relatively little action. In no other garrison were the rebels afforded the opportunity to fire into a large, and relatively compact, body of troops at such close distance. Nowhere else did they inflict so much damage on the British forces. Parochial House was held by four volunteers during the battle, who later evacuated the property and were captured by British forces. 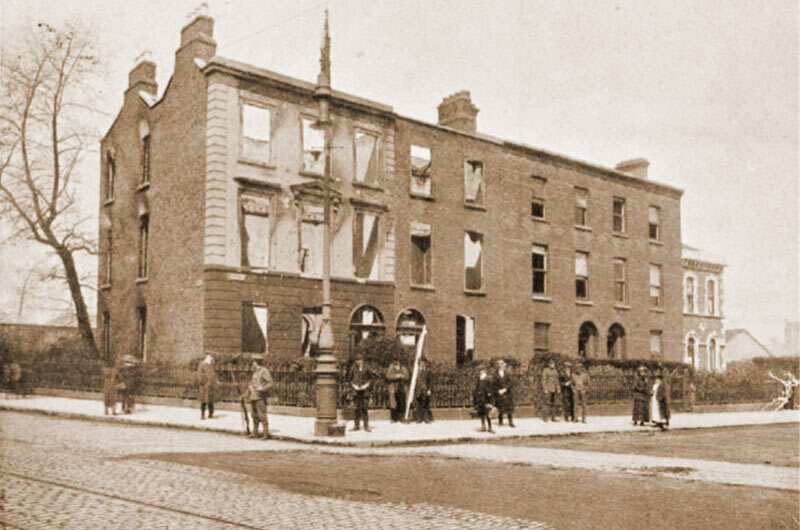 The burnt out shell of Clanwilliam House after the battle of Mount Street Bridge in 1916 before demolition. 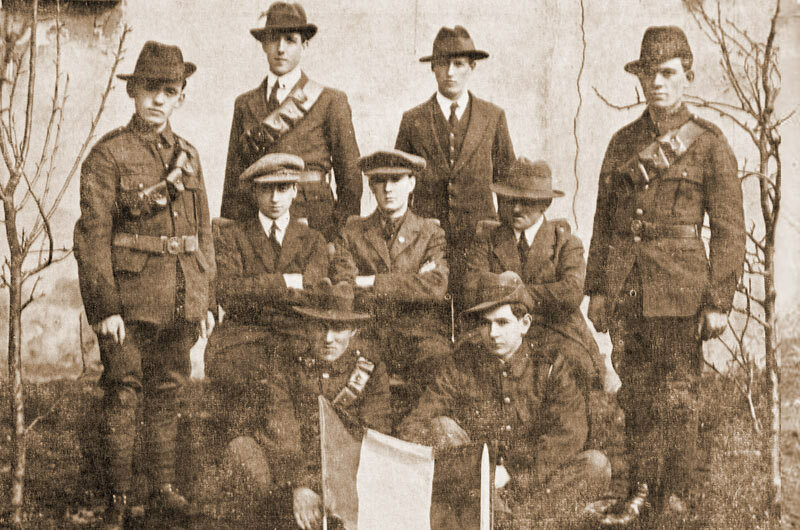 Use the links below to discover more about the Irish Volunteers involved, the British Troops, the weapons used, the buildings and sites occupied, and the sources for the information. The Irish Volunteers involved in the battle held up two nearly full-strength British battalions (some 1750 soldiers) for several hours on Wednesday 26 April. 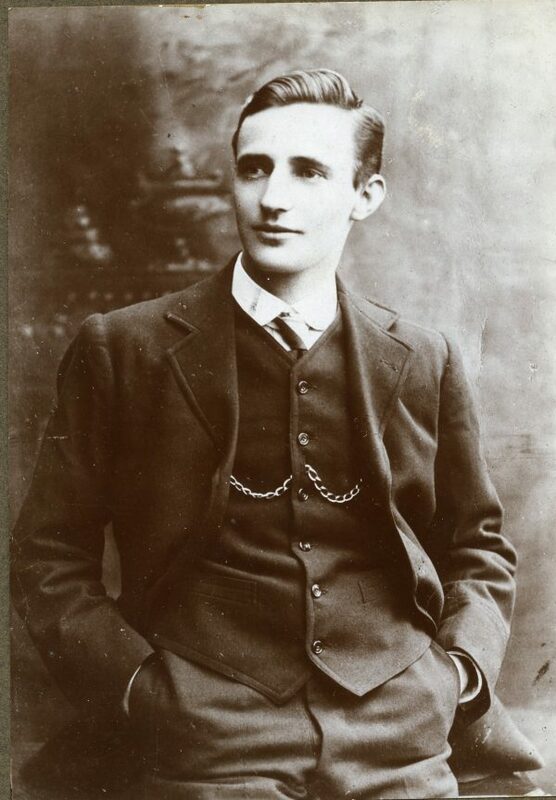 Learn about the Irish men, four of which lost their lives, who fought on 26 April 1916. Two Battalions of the Sherwood Foresters, the 2/6 and the 2/7th of the Notts. and Derby Regiment (some 1750 troops), were mobilised on Tuesday 25th April, a day after the Rising was declared to support the British troops already in Ireland. 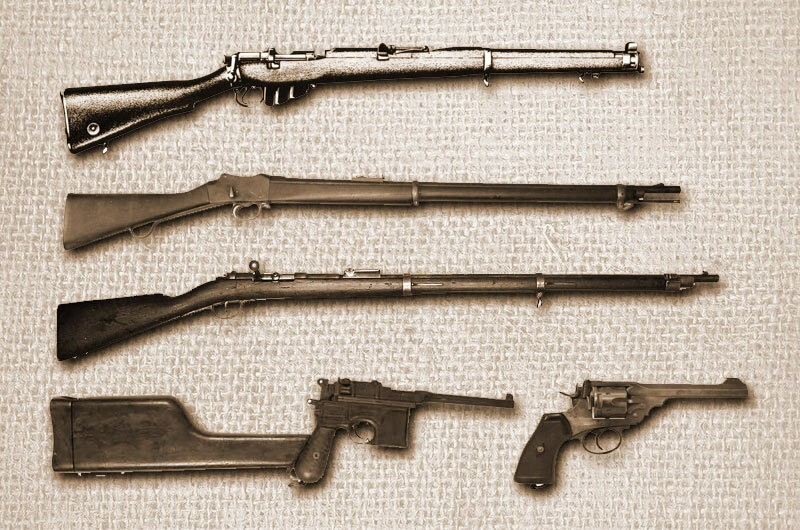 A wide variety of arms were used by the Irish Volunteers, who had little opportunity for significant training with live ammo, thus making their success all the more remarkable. Learn about the weapons used by both sides during the battle. Although commonly referred to as The Battle of Mount Street Bridge, in reality, the battle site covered a much wider area. Learn about the buildings occupied by the Volunteers and the positions taken up by the British forces.